I had a meeting the other day with a gentleman I admire greatly. He’s really a super individual: smart, very business savvy, has a great heart for important causes and practices the art of service — in other words, the ideal Rotarian. I had originally met him at a Rotary club where I was speaking, so I had always believed he WAS a Rotarian. Imainge my surprise when he told me he wasn’t actually a Rotarian, but he had been made an honorary Rotarian because of his service to both the club and the community as a whole. I found this quite surprising. When I asked him why he didn’t become an actual Rotarian, his answer surprised me: he shared with me very frankly that, in his opinion, there were too many people in the club that, while they all talked about the importance of The 4-Way Test, they didn’t really live it. Now, this happened several days ago, but it stuck in my craw and has been bugging me ever since. I’ve had the same experiences myself, I have to admit, and it really troubles me when a fellow Rotarian behaves in a way that goes against the principles of The 4-Way Test. Especially when they act that way toward other Rotarians. Now, I’ve certainly discussed the individual meaning of the points of The 4-Way Test in other posts, so I don’t plan to do that again here. Feel free to look those up if you want to explore its meaning and significance more deeply. What I do want to talk about is the importance of not only reciting it, but the importance of believing it and living it, if you are truly bought into the purpose and meaning of Rotary. 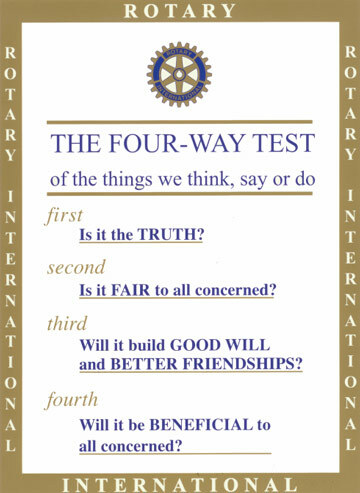 As I say in my presentations to Rotary clubs, both across the country and internationally, The 4-Way Test is a lot like our social skills and character: it is who we are and what we are, regardless of what else we are doing. 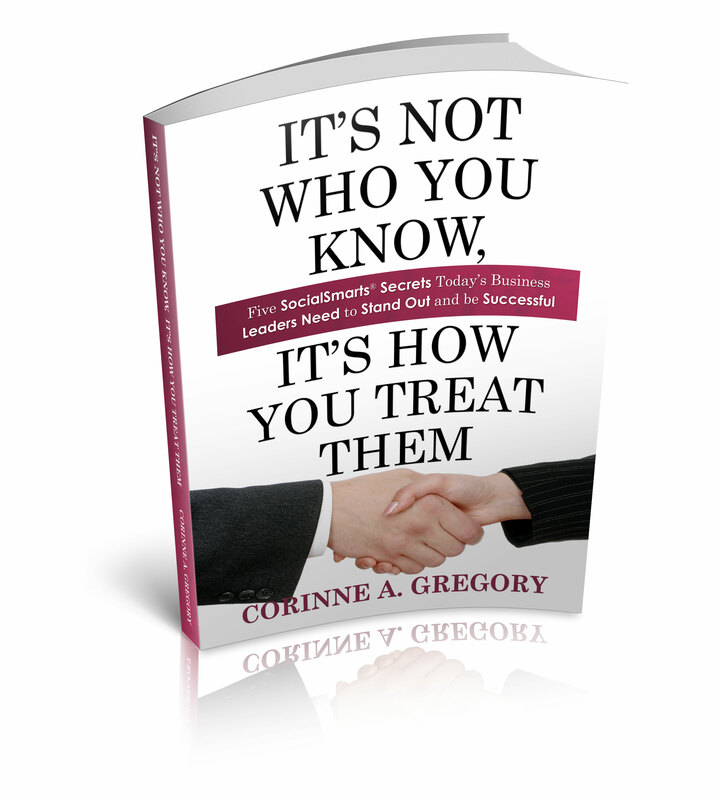 And, testing our behavior and conduct against The 4-Way Test applies to anyone with whom we are interacting. As I mention, there’s this tiny little word — “all” — in the last point of The 4-Way Test that means “everyone.” Not just those people we like, or those who can help us in some fashion, or just Rotarians. It’s everyone, every time, all the time. So, naturally, it’s particularly troubling when we see Rotarians acting in a way that contradicts what they say they believe in and stand for. Of course, we’re all imperfect human beings…we are fraught with making mistakes. But there are times when the violations are so obvious and so egregious that it’s hard to overlook. When the misconduct occurs with another Rotarian…well, then it’s really a slap in the face. We’re supposed to be part of one large, internationally family that treats people fairly. One family member shouldn’t be intentionally hurting or offending another, should they? I did end up deleting the piece; it occurred to me that while I was trying to make a point about the obstacles those of us sometimes face in trying to improve the education of our kids, and how the “system’ works against it, because it had upset a fellow Rotarian, it seemed what I wrote and published didn’t really adhere to The Four-Way Test. Yes, it was true. Yes, it was a fair piece and a fair assessment of what had happened. It apparently didn’t build goodwill and better friendships, that much became clear. And, while it was likely fair to all concerned, when considered objectively, one of the parties (the super) clearly didn’t agreed. Therefore, in deference to a fellow Rotarian’s discomfort, I removed it. I’m sure there are many of you now thinking I’m a wimp. Maybe true,– perhaps I shouldn’t have given in to the superintendent’s pressure — but there’s a second part to this tale. Once I got over the shock of having been raked over the coals by the super, I started getting mad. “Wait a minute…what gave him the right to bully me?” Even if he got mad because I was bold enough to write the truth, he was himself violating The 4-Way Test by how he was treating me. And, the reality is, his behavior permanently clouded my opinion of him, and destroyed, in my opinion, any credibility and respect he ever had with me. But back to the original part where this story started. I’ve seen other examples of this decidedly non-Rotarian behavior in other clubs, and it always disturbs me. The 4-Way Test is not there for us to abuse or hide behind. It’s also not there for us to assume a “holier-than-thou” attitude (“I’m a better Rotarian because I live it and you don’t”). We are supposed to do more than talk the talk, and we’re certainly not supposed to become hypocrites. Again, yes, we Rotarians are as human as the next person, but I see The 4-Way Test as a challenge — it’s a challenge to us to try continually to be better human beings. We should test, Test, TEST everything we think, say or do to ensure that we remain true to our lofty ideals. Yes, we’ll slip up, but on the whole, our conduct should weigh in on the side of “adheres to” rather than “not.” Then our occasional transgressions aren’t so bad and won’t undermine our character or others’ perceptions of our character. I guess it comes down to this: if you see Rotary as a place to have a meal and network with other people, than perhaps Rotary — and all it stands for — isn’t the best place for you. But, if you are willing to embrace not just a concept, but a belief and practice — of service, of fair and just behavior and conduct, of integrity — then I strongly encourage you to consider Rotary. And consider doing your very best to uphold and practice those principles we hold dear. Everywhere, with everyone, all the time. ← Life is short…are you LIVING? Your article came to me at a perfect time. Thank you for writing it! I am having an issue right now with a Rotarian and frankly when she wrote her email to me and a few others, the first thing I thought of was the 4-Way Test and how much it was ignored. I love it that you are challenging people in this article—and you are right – the 4Way test is supposed to be a WAY OF LIFE, not some saying you post or just refer to. I joined the Rotary thinking that Rotarians do seriously let the 4Way Test guide them and have been disappointed to experience that this is not so in the case of this person. But, this is how it is – just as people forget a company’s mission or forget their ideals, so do Rotarians. I have to say I am glad, however, that for one person who makes a mockery of the 4 Way Test, I have met many many more who exemplify wonderful ideals. Perhaps in our own way we can affect others and remind others of what Rotary stands for- one person at a time. Now if I can just keep remembering that as I deal with my own experience (as you did with that bully) – life will be perfect. Haha. Thank you again for writing that article. You helped me more than you know. I want to ask you if I can have your authorization to print and distribute it??? Dorie, I’m glad this was able to help. Yes, of course, you may share this with others. I just ask that you fully credit/attribute it to me, and, if you’d be so kind, to provide a link for more inf. I understand how our own failure to live the 4-Way Test creates problems and questions why we became Rotarians. In our club the issue is more likely to be a random political potshot. The part of the article about bullying, especially as you detail your later response, leads me to suggest you consider perusing either Your Perfect Right or Responsible Assertive Behavior. Your initial shock, then compliance, then subsequent resentment/anger are certainly legitimate responses. As a communication educator, they also suggest issues with communication apprehension and/or assertiveness. I hope the books help you find ways to stand up for yourself without belittling others.